Activation of small molecules, especially the ones that are detrimental to the environment such as CO2 and SO2, is a fun-filled all-time active area of research. To begin with, LiSBiC plays with SO2 in a peculiar and simple way. We employ already known easily synthesisable simple molecules that undergo aerial oxidation readily. For example, benzothiazolines notorius to undergo aerial oxidation under ambient conditions by loosing hydride in order to finally yield benzothiazoles, which is another family of pharmaceutical interest. We conveniently intervene the aforementoned aerial oxidation to activate SO2 into sulphuric acid (ref). 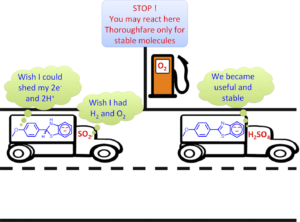 Now that our koneramine complexes can be constructed with electron sinks and redox active metal ions that also comprise centers of elevated electron density to attract these small molecules, we are poised to see new directions of activation of few small molecules. Funding Agency: Ministry of Earth Sciences, Government of India. Copyright 2018 © Creatorswebindia | Designed by "Namba Thambi Rajesh"